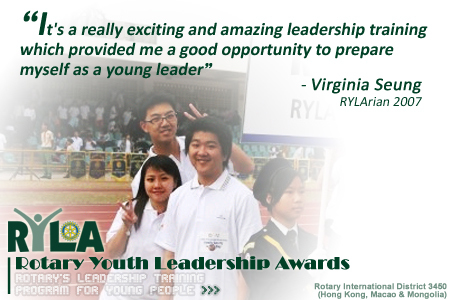 Here our RYLArians are eager to tell you their experience and insight gained in RYLA. 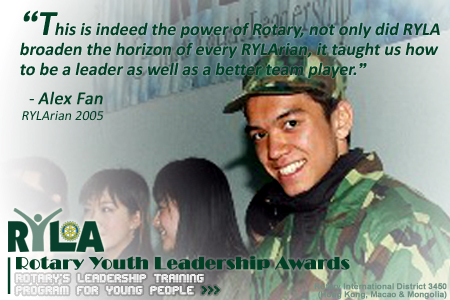 I joined RYLA twice in year 2003 - 2004 and 2006 - 2007. It's a really exciting and amazing leadership training which provided me a good opportunity to know more about Rotary and Rotaract, to prepare myself as a young leader and to meet friends from all walks of life. 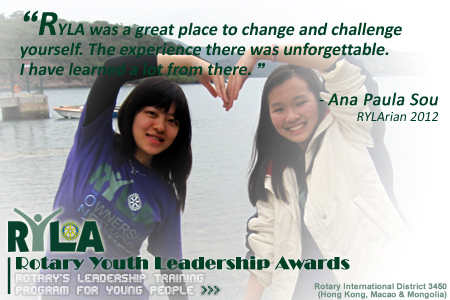 You may wonder, "Why did you join RYLA two times?" It's because I failed to complete the RYLA in year 2003 - 2004 as my leg was hurt during a running task. 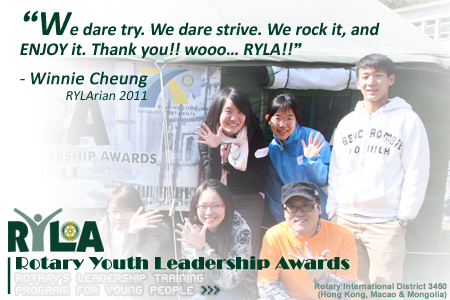 However, I must say "thank you" to RYLA! The injury was actually a blessing in disguise: it was only when my doctor examined my injury after the RYLA camp that I found out my anterior cruciate ligament was indeed broken a few years ago! 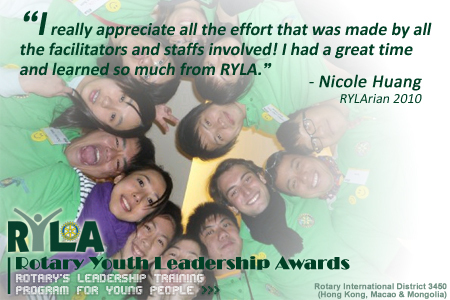 Thank you RYLA! 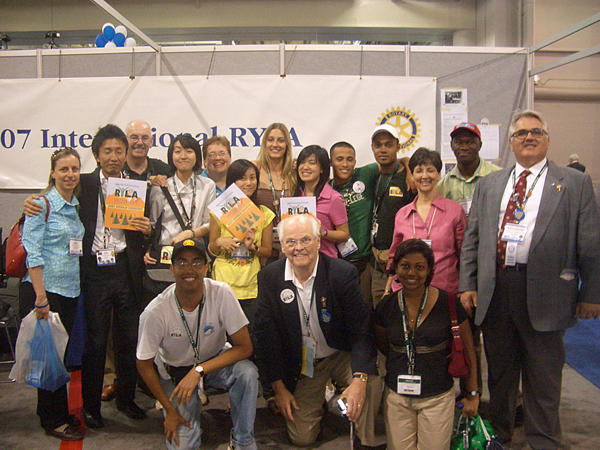 After the surgery, I decided to join RYLA again in 2006-2007 to complete one of the dreams in my Rotaract life. 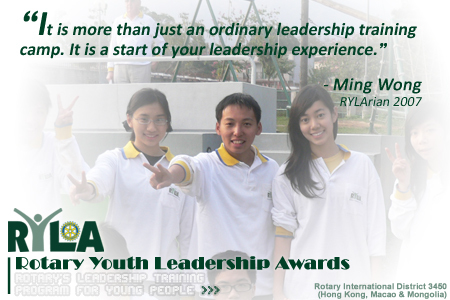 Come and join RYLA 2009 - 2010! You will learn more about the importance of communication skills, problem solving skills and conflict management, and how these skills contribute to effective leadership. Also, you will build self-confidence and self-esteem through the exciting tasks. Don't miss this golden opportunity and fill out the application form NOW! 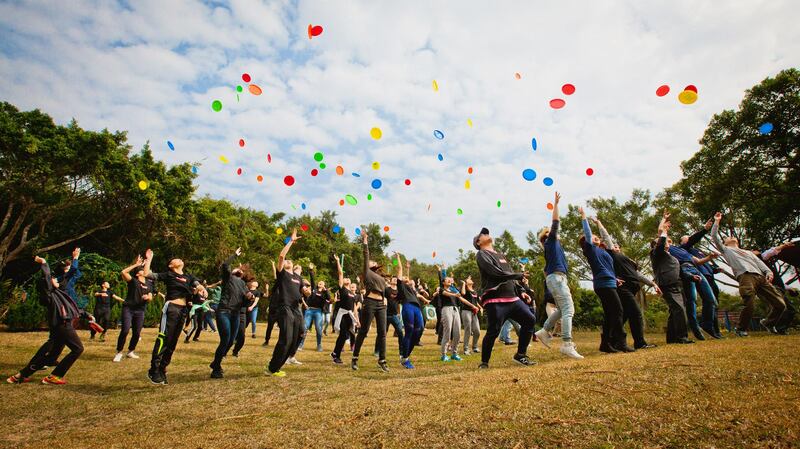 It is more than just an ordinary leadership training camp. It is a start of your leadership experience. Hello this is Alex, best RYLArian of 2004 - 2005. It has been a few years since my participation in RYLA, yet every time I look back on the trip, it was a fruitful experience. 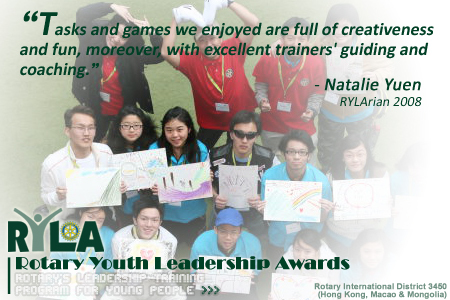 RYLA provides a platform for young people to build up leadership, teamwork and discipline which many teenagers in Hong Kong lack. The program covered foot drill training, physical activities and sightseeing. Above all, the mix of different people made the program special. People from Mongolia, Macau and Hong Kong gathered for 4 days and it was such a good chance for us to discover the cultural differences. This is indeed the power of Rotary, not only did RYLA broaden the horizon of every RYLArian, it taught us how to be a leader as well as a better team player. I highly recommend that everyone to join this meaningful program! 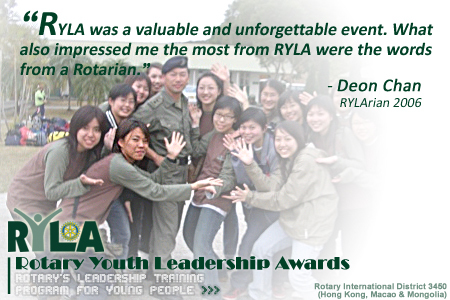 The chance to experience army life was the reason why I joined RYLA. It was a valuable and unforgettable event as it is not easy to come across military knowledge, such as how to work in the dark without alerting your enemy, radio voice procedure and drill practice. Our instructors were ex-soldiers and they were a living textbook to learn from. When they were performing their duties in the army, the most important part was to keep everyone informed of the situation; The weather, feature, enemy direction, etc. Although we may not become a soldier, their attitude can still be applied to the challenges in our lives. 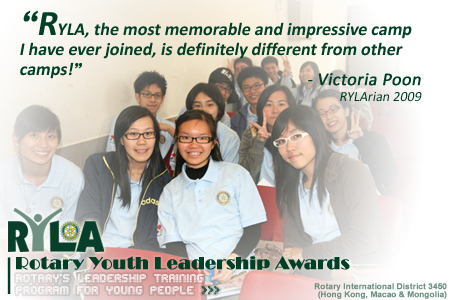 What also impressed me the most from RYLA were the words from a Rotarian. He said that "Leadership is not for yourself". It is very true, God gave you leadership skills, but how to use it so as to create the biggest benefit to society? I joined RYLA in 2003. It was such an extraordinary experience even though the contents were as harsh as military training. Yet, I had no criticism because I believe these activities could train the RYLArians to be more tough, disciplinary and with higher spirit, more importantly, to be great leaders in the future. I'll never forget the way you leaned on me, the laughters we shared, and the crazy things we did. Thank you RYLA for this wonderful experience, and what's more important is that we've all become leaders who are always ready to serve. 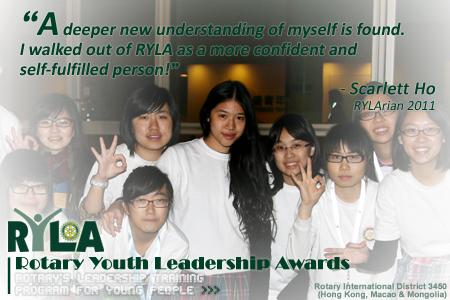 I had quite a reserved personality before my RYLA-experience, but RYLA has opened me up to a very different world. For the first time in my life, I spent 3 full days immerse in an atmosphere full of fiery spirits. Since then, the passion hidden within my heart has unleashed, propelling me to new heights. RYLA is a great experience, great challenge, and a great opportunity for young leaders like us to join, to learn and to lead. "There's a thin line between leader and follower." 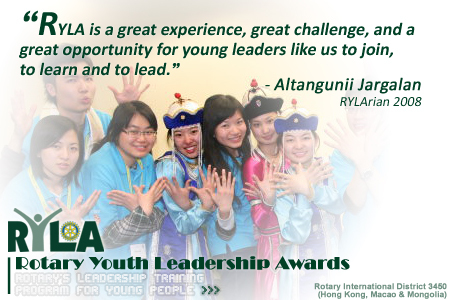 This idea has been engraved in my mind since I joined RYLA. Throughout the four consecutive days, the program offered me the chance to perform the role as a leader as well as a follower. Reflecting upon RYLA, I must say that the "high event" (one of the rope courses) spoke to me the most. I am still able to recall vividly my frustration and inner struggle before going for the challenging task, yet I finally made it under the unconditional support from my "Four-in-love" group mates. 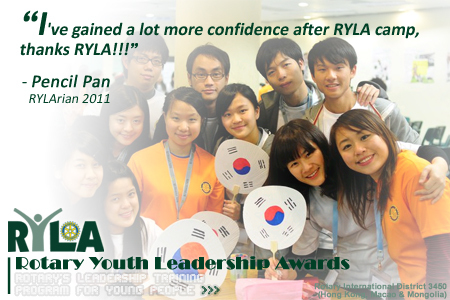 RYLA is definitely something that you should not miss! 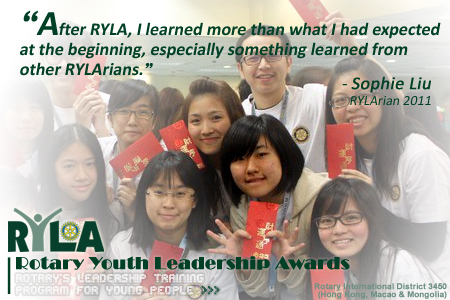 As a RYLArian in 2007-2008, I can still remember how much I learned and changed after attending RLYA. 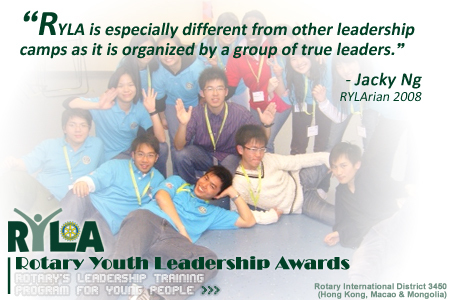 RYLA is especially different from other leadership camps as it is organized by a group of true leaders. They have very rich leadership experiences and are willing to share their leadership skills through the camp. Apart from that, we experienced the life of poor people in developing countries in the simulation section held in Crossroads, I was inspired to volunteer and serve the society. Since then, I worked as a committee of several societies and became a volunteer of several events. When I look back, I really want to thank RYLA for providing me opportunity to develop my leadership skills and understand my inner-self. I still remember the dates I participated in RYLA crossed over 14th February, Valentine's Day! I am so happy to find my valentines there. Yes! I need to add a "s" there as I found a lot of lovers, who were willing to put their love into action, to serve and support one another! Lots of tasks were very challenging, so what we are talking aren't only about team work, but also trust and care! Tasks and games we enjoyed are full of creativeness and fun, moreover, with excellent trainers' guiding and coaching, we became better equipped to be a better leader. So DO come and join us! Experience what you had never expected! Bienvenue à RYLA. Welcome to RYLA. 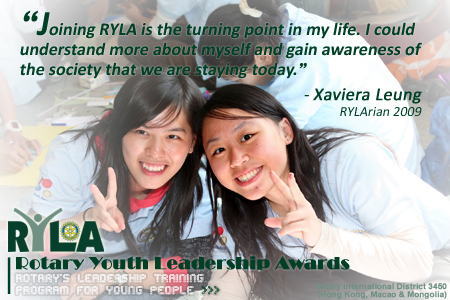 Joining RYLA is the turning point in my life. Not only could I have the opportunity to meet bright young leaders across different regions, but I could also understand more about myself and gain awareness of the society that we are staying today. Now, here comes your turn. It's time for you to shine on the stage. You are about to experience what I had last year or probably more. Be the change you want to see in the world. Leaders, the future is in your hands. Come on everyone, believe yourself. Let's take the initiative to explore whatever RYLA is going to offer you because you can never predict that you will going to make it if you don't attempt it first. Enjoy the coming training, have fun and network with your companions. Do seize every valuable chance that ahead of you and hope you all have a wonderful and unique RYLA experience. 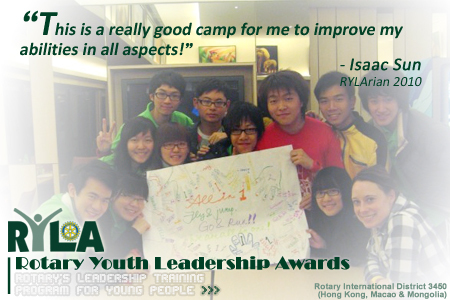 RYLA, the most memorable and impressive camp I have ever joined, is definitely different from other camps! Meeting new friends from different backgrounds, exchanging ideas about leadership and other issues and cooperating with others will surely let you have a new attitude towards life! So, don't hesitate to join us NOW! "Keep up the good work! 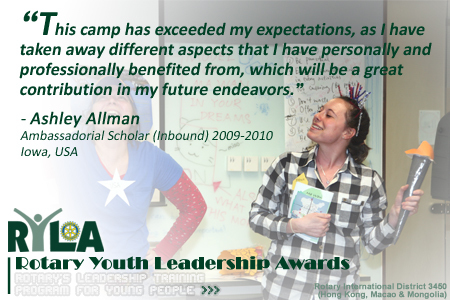 I realized my real potential at RYLA." "Overall, it was awesome!!! Thanks so much for the hard work! I really appreciate all the effort that was made by all the facilitators and staffs involved!! Once RYLArian, forever RYLArian!! Well done!! I had a great time and learned so much from it." "This is a really good camp for me to improve my abilities in all aspects!" 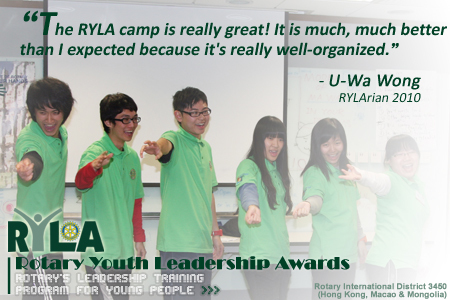 "The RYLA camp is really great! It is much, much better than I expected because it's really well-organized." 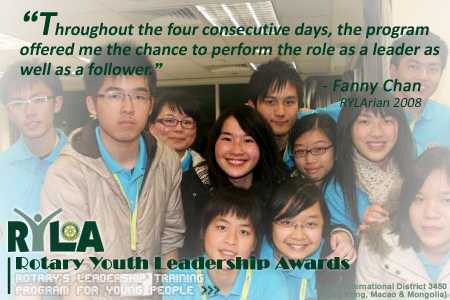 "I had a deep impression of 'Leader is not just leading, but also encouraging!' I'm gonna apply it!" "It's really memorable and unforgettable. It helped me a lot and I have gained a lot of experience." "Everyone is a leader. Take your role to make the World a better place. Once RYLArians, Forever RYLArians!!" 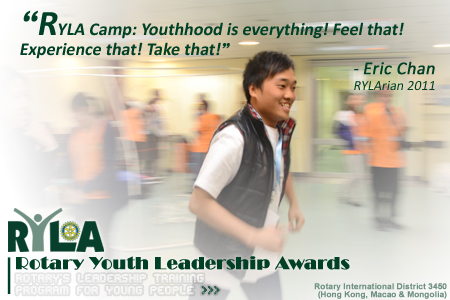 "RYLA Camp: Youthhood is everything! Feel that! Experience that! Take that!" 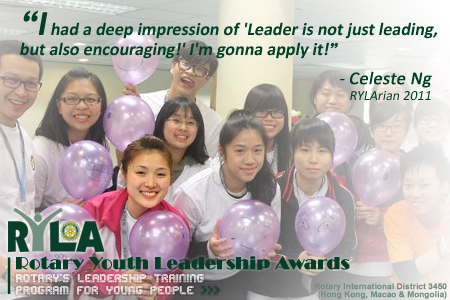 "RYLA has shown me that being a leader means always being prepared to give the best and strive for excellence." 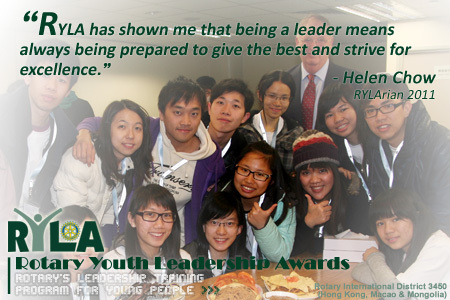 "Thank you RYLA for giving me the greatest experince I've ever had! I love RYLA!" 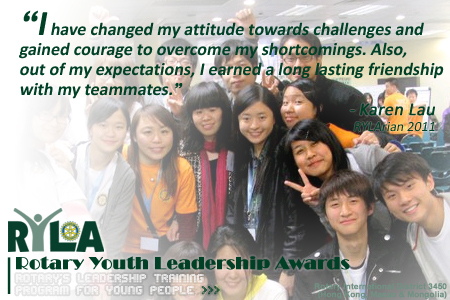 "After this RYLA camp, I am inspired to embrace different challenges in the future. Yes! Just do it!" "I never thought that I could be that brave! 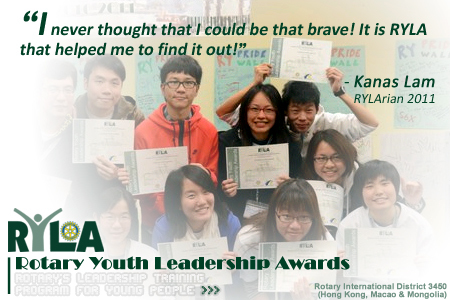 It is RYLA that helped me to find it out!" "I have changed my attitude towards challenges and gained courage to overcome my shortcomings. Also, out of my expectations, I earned a long lasting friendship with my teammates." 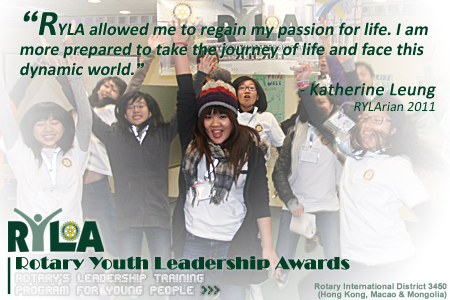 "RYLA allowed me to regain my passion for life. I am more prepared to take the journey of life and face this dynamic world." 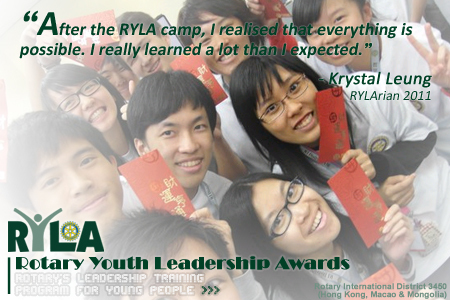 "I had a brand new experience in RYLA! You will never regret! 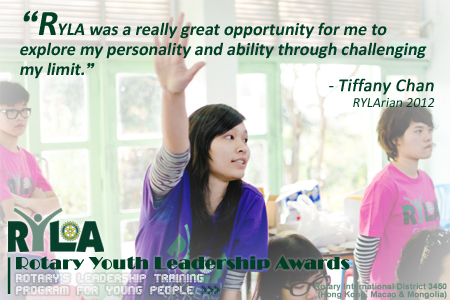 :D"
"I have benefited greatly from RYLA as it has taught me a lot indeed and has enhanced my abilities in different aspects. The experience is truly unforgettable!" 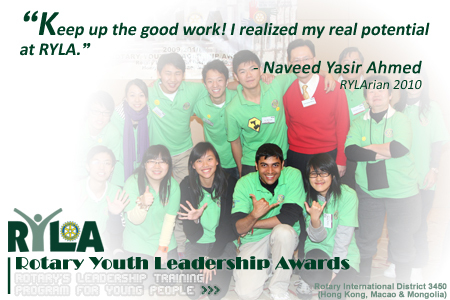 "After the RYLA camp, I realised that everything is possible. I really learned a lot than I expected." 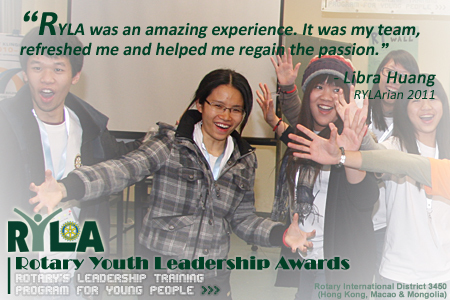 "RYLA was an amazing experience. It was my team, refreshed me and helped me regain the passion." "I've gained a lot more confidence after RYLA camp, thanks RYLA!!!" "A deeper new understanding of myself is found. 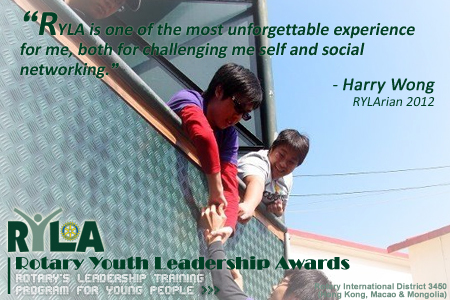 I walked out of RYLA as a more confident and self-fulfilled person!" 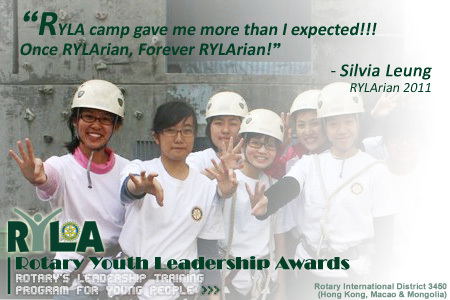 "RYLA camp gave me more than I expected!!! Once RYLArian, Forever RYLArian!" 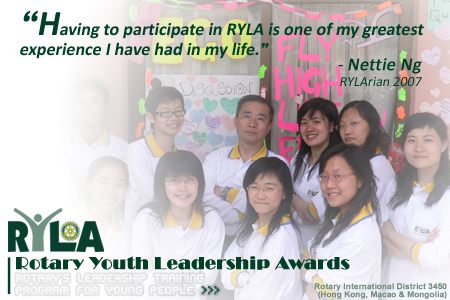 "After RYLA, I learned more than what I had expected at the beginning, especially something learned from other RYLArians." 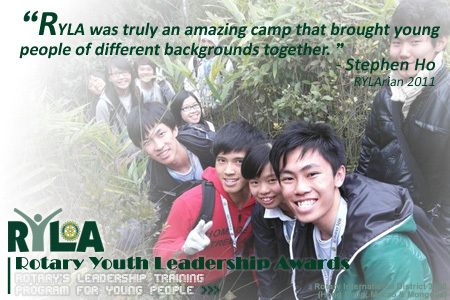 "RYLA was truly an amazing camp that brought young people of different backgrounds together." "I feel relaxed when I faced challenge. RYLA was a good experience to me, thanks!" "We dare try. We dare strive. We rock it, and ENJOY it. Thank you!! wooo... RYLA!!" "The coolest camp and the most awesome teammates ever!! Leadership was built upon friendship!!" 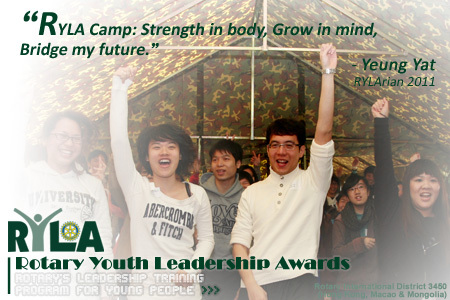 "RYLA Camp: Strength in body, Grow in mind, Bridge my future." 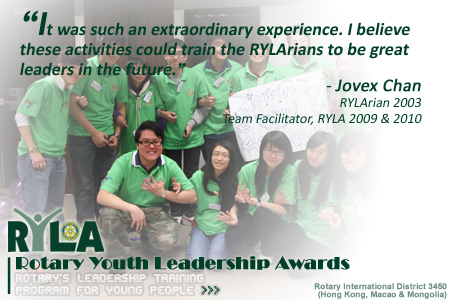 "I joined RYLA because I'm a Rotaractor. 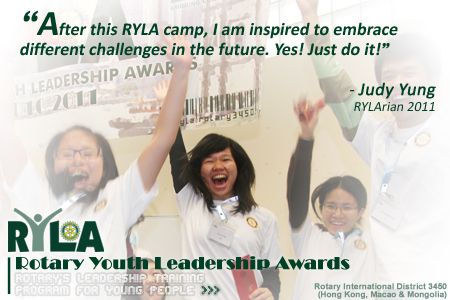 I heard that RYLA was a great place to change and challenge yourself. 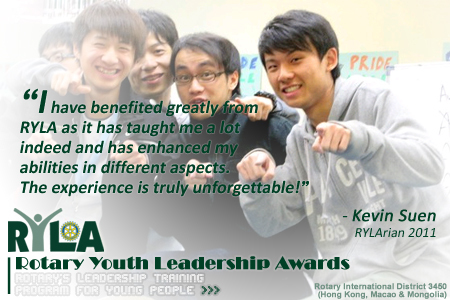 After I joined RYLA, the experience there was unforgettable. I have learned a lot from there, and I believe in one sentence - "Never believe that a few caring people can't change the world. For indeed that's all who ever have." You could be that small group of people if you think you want to be. So, don't hesitate and join it!" "During the 4-day RYLA camp, I had a great experience, met a lot of smart people there and built a new social network that I never have. Honestly, I was hesitated to go for it, but I am happy that I did it. Don't hesitate, if you're still thinking to join or not." 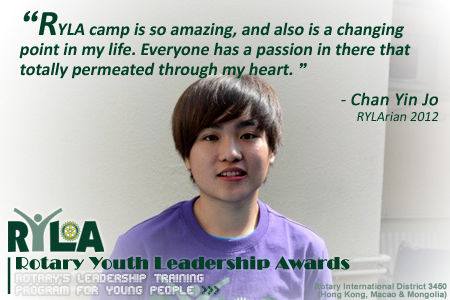 "
"To me, RYLA camp is so amazing, and also is a changing point in my life. Everyone has a passion in there that totally permeated through my heart. Moreover, every picture of the RYLA camp is clearly staying in my mind, even though after a half or few years. It seems as if that had happened yesterday." 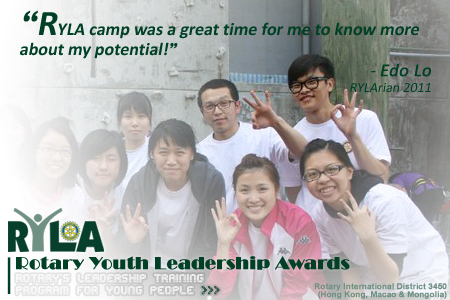 "
"Being part of the RYLA 2011-2012 Camp was one of the best experience in my life. I took challenges, conquered the fear and met a group of life-long friends here. 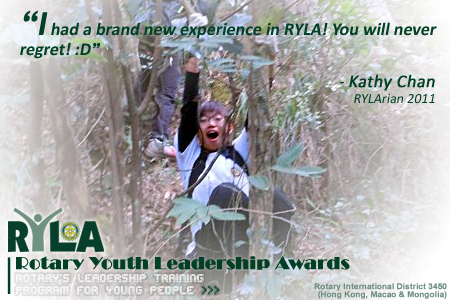 Thanks RYLA, it's awesome!" 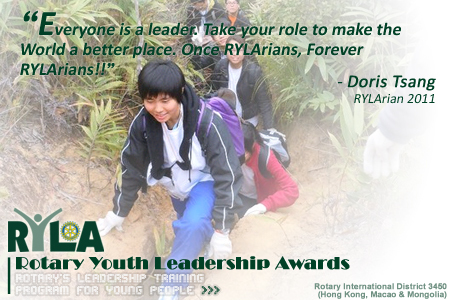 "
"Before I join RYLA, I like a stray. I have never imagined that I can get so much through RYLA, a lot of skills, a lot of friends, and a mirror which made me know more about myself. 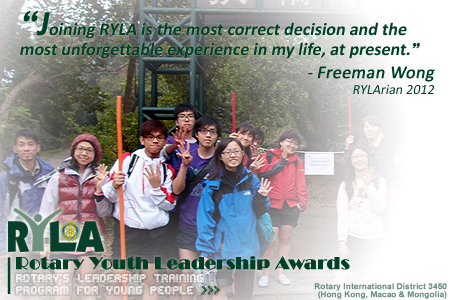 Joining RYLA is the most correct decision and the most unforgettable experience in my life, at present. 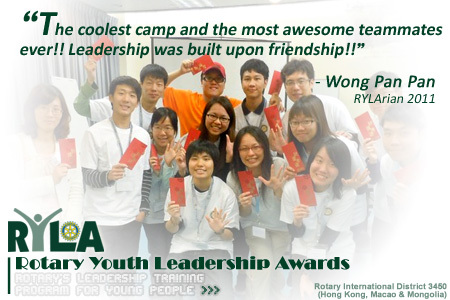 Thank dear OC of RYLA 2012 for giving us such a wonderful memory!" 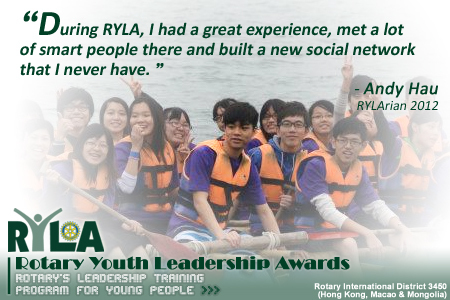 "RYLA is one of the most unforgettable experience for me, both for challenging me self and social networking. So don't hesitate to join and it is free of charge also." 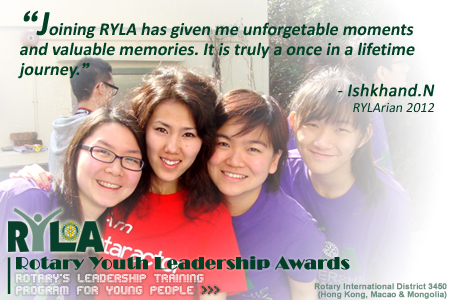 "
"Joining RYLA has given me unforgettable moments and valuable memories. It is truly a once in a lifetime journey." 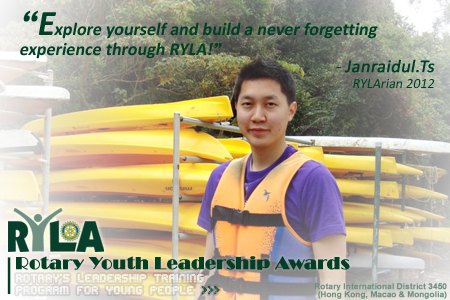 "
"Explore yourself and build a never forgetting experience through RYLA!" 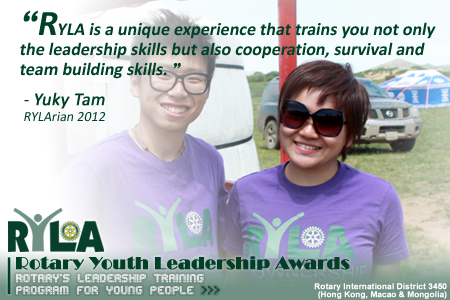 "
"I learned a lot in the RYLA camp. Through different tasks in the camp, I knew more about my strength and weakness. This was an unforgettable and wonderful experience in my life. Thanks Rotary for holding such a great camp for the youngsters." "
"The most memorable thing in the camp is the night walking in which we needed to walk in a dark environment for about eight hours and performed some challenging tasks during the trip. However, we trusted and encouraged each other to complete such a demanding trip. Above all, I learned every team or group is just like a chain and there is no way to improve its performance unless we are willing to help the weakest one inside. This idea really inspired me deeply." "
"I am so glad that I was able to spend the four days with other RYLArians. It was a really great opportunity for me to explore my personality and ability through challenging my limit. Leaders are not born but made. Take the first step to learn can always help you to be a good leader!" 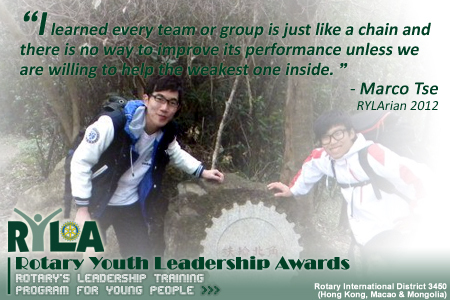 "
"RYLA is a unique experience that trains you not only the leadership skills but also cooperation, survival and team building skills. These are key factors contributing to a great leader but are somehow ignored. There are daily themes of the RYLA which are "Ownership", "Network" and "Embrace", the message behind is that "a great leader can make use of its NETWORK to achieve its OWN responsibility with the EMBRACE of different stances". In RYLA, I met a group of life-long friends. Although we don't see often because of busy life, we always talk on phone and share our views on life, job and fun. The RYLA experience also gives us an insight of "take and give", so we did voluntary service together as to contribute the society. And we also travelled together in Macau and in Mongolia." They are proud of being RYLArians. What about you?